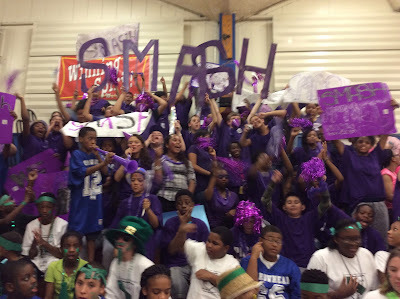 I thought last year's building kick-off rally was the best ever, but our 2015 kick-off was even greater! 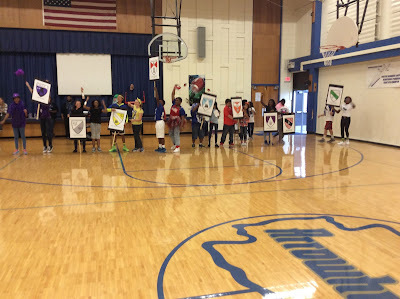 Every teacher and staff member got into the spirit and led their student groups (the esteemed Houses of Arrowhead Middle School) to new heights. The House of Strong Foundation won the year-long building competition for the second year in a row last school year, so the teachers in other Houses are highly motivated to unseat them. Strong Foundation, however, is set on a three-peat. 1. Establish a building-wide theme. Think of a message that will uplift and encourage everyone. 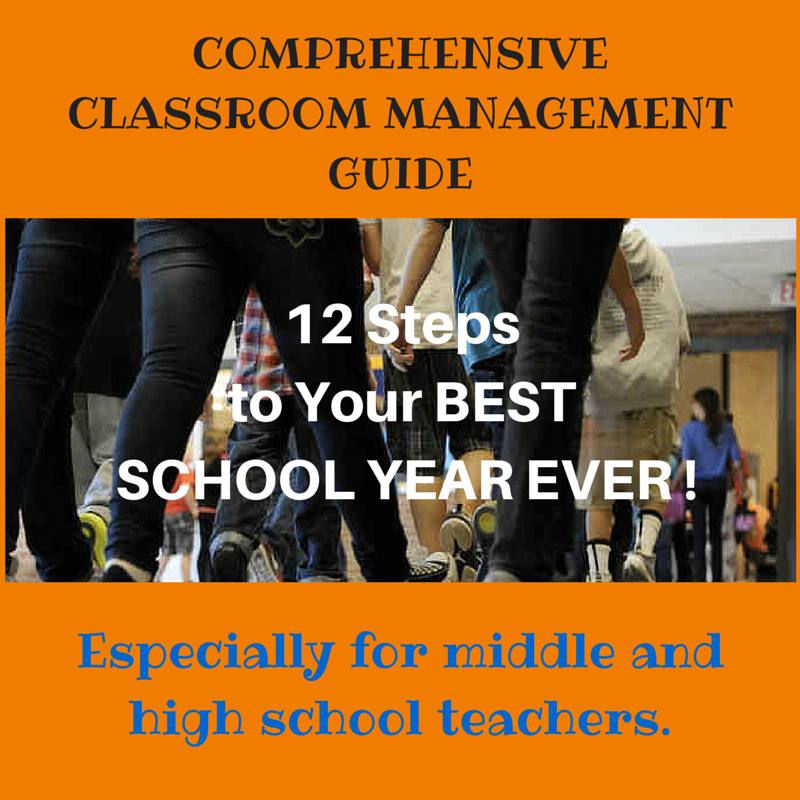 Communicate the theme to the staff early in the summer so teachers can be thinking about how to make the messages visible in their classrooms. 2. Convene a committee to plan and facilitate your rally. The more students and staff are involved in the rally, the more motivational it will be. It's a big job for just one person. Many hands make light work. Our Renaissance committee has become very efficient at generating ideas, dividing the work, and following through. Set the agenda. 3. Arrange for and confirm any guest speakers or performers. 5. Have your cameras ready! Have fun! Washington High School Marching Band and Dance Team is on the floor playing as student groups enter and take their seats. Every student and teacher is enthralled. The horns and percussion get everyone hyped. More than half of the performers are former Arrowhead students. As the band left the floor, we darkened the room for a slide show of highlights from last school year set to the song "Game On." We started the fog machine as our cheerleaders unfurled a paper banner with our theme painted on it. The football players, in their team jerseys formed a walking path. 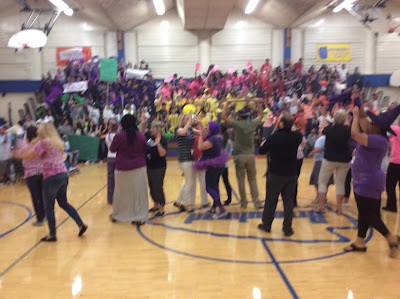 The Master of Ceremonies, our theater teacher, Mr. Brame, began to introduce the teaching teams as the sixth-grade team ran in through the banner. The kids started cheering so loudly for their teachers that we couldn't even hear the entire introduction. 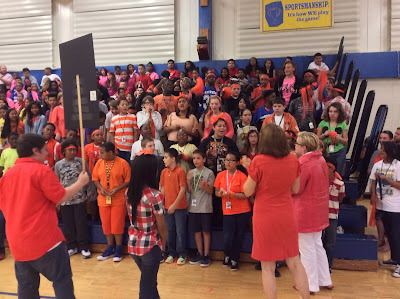 The students and teachers rocked to the Arrowhead Rap, written and performed by our campus officer. Next, I introduce our guest speaker. This year, Dr. Evelyn Hill, President of our district Board of Education excited and encouraged the audience for our coming school year. Mr. Brame introduced the judges for the spirit competition. Members of the community were recruited to be impartial judges of how each House conveyed spirit during the rally. They earned points based on visibility (color, props, face paint, etc. ); their cheer or chant (participation of their members, loudness); and sportsmanship (cheering for and acknowledging others). 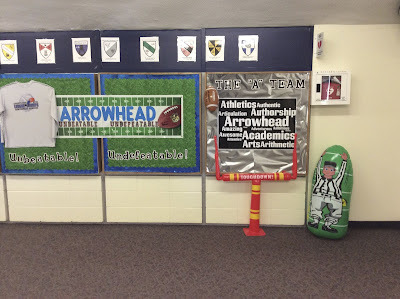 Four eighth-graders spoke briefly about what they love about Arrowhead. This part of the program was especially confirming for me. The kids described exactly the school we have purposed to create over the past years. As the students said, they entered somewhat scared and intimidated as sixth-graders but quickly learned that Arrowhead is a safe place to be. They felt like everyone was accepted for who they are, that their teachers would do anything for them, and that they had an opportunity to shine. Three more captains led their House cheers in succession. A couple of teachers introduced an opportunity for community service and informed students about how to apply for their program. The remaining three pairs of captains led their House cheers in succession. Then it was time for this year's House competition. We learned to have three Houses compete at a time through three heats. The winner of each heat then competes in a final contest for 1st, 2nd, and 3rd place House points. We always have the House captains and one teacher sponsor from each House play in the first competition of the year. The kids go wild, cheering as if the game is the Super Bowl or World Series! The first game - for three heats - was a speed cup-stacking race. For the final, one member of each three-person team had to blow up a balloon. Another member had to tie the balloon. The final member had to pop the balloon by sitting on it. Finally, it was my turn to share how students can earn House points, how individual members can become their House's Most Valuable Player, and what they were playing for. 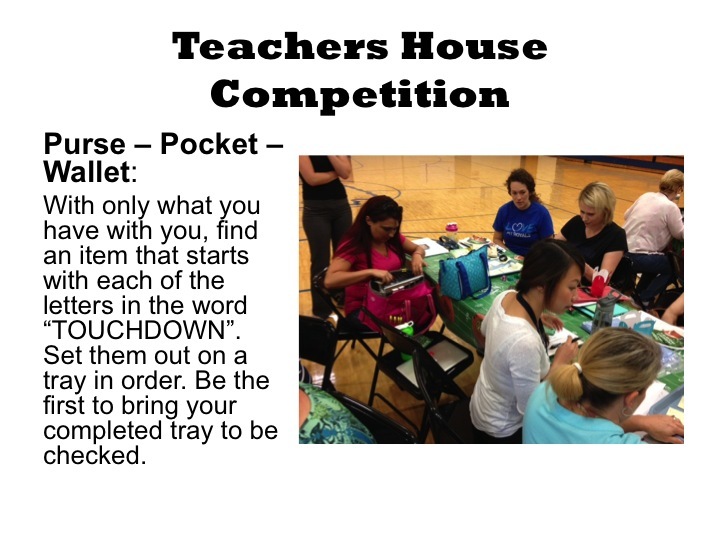 I shared how the competition always starts before they even come to school with their teachers competing for their first House points at our August inservice. 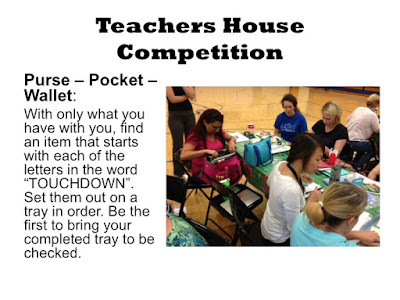 This year, the teachers' House competition was a game called Purses, Pockets, Wallets. Before we dismiss the crowd, we make sure they know that, while everyone got to come to the kick-off rally, the quarterly rallies from now on have to be earned. 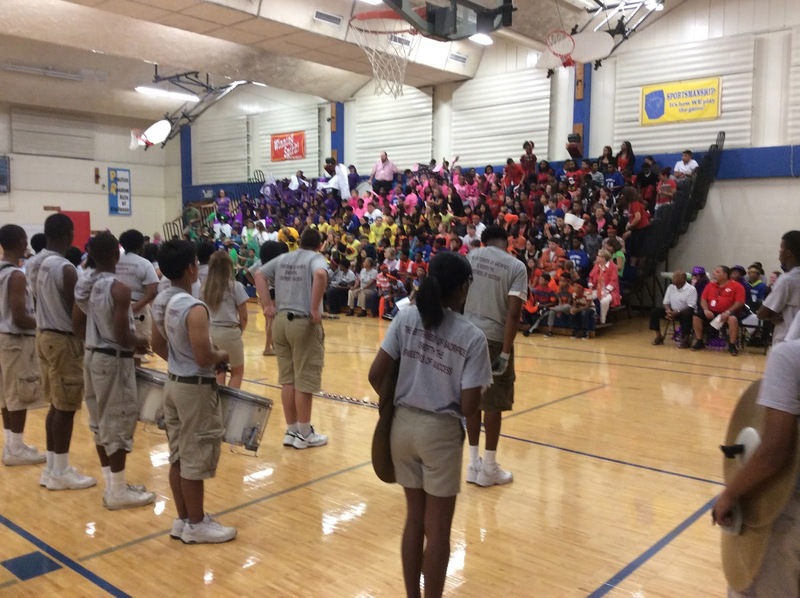 Only students earning C's or better in all classes are invited to the fun events, including rallies, throughout the year. If they don't have C's or better when it is time for the next rally, they will be working to get their grades up back in the classroom, while those who do have C's or better will be enjoying the rally. After this first fabulous assembly, no one will want to miss out! BIG THANKS to the Renaissance Committee but also to every teacher and staff member who contributed to this awesome school event. It set the tone for an even more positive school culture and even higher achievement. I am so proud of our faculty and students!